It is January 1941, at a clinic near Cologne—more specifically, in the office of Victor Franz (Karl Kenzler), the clinic’s director. Victor, a former idealist who devoted himself to pediatrics in order to help children, is now a world-weary bureaucrat whose facility houses disabled children: “spastics, cripples, retards. Incurables, you know,” as Victor describes them. But the clinic is a temporary stop for many of the “patients”: on orders from Berlin, on the first Tuesday of every month the most severe cases are bused to a nearby institute where they are killed. (An introduction to the script notes that from 1939 to 1941, 100,000 disabled people, labeled by the Nazis as lebensunwertes Leben [lives unworthy of life], were killed.) There is the chilling detail that the buses have painted-out windows so the children can be told they are being taken on a trip along the Rhine. Bishop von Galen (John Glover) blesses Martha (Jennifer Dundas), in Stephen Unwin’s All Our Children. Top: John Glover (left) as Bishop von Galen, Karl Kenzler (center) as Victor Franz, and Sam Lilja as Eric Schmidt. This detail is relayed by Eric Schmidt (Sam Lilja), the clinic’s deputy director, a young, zealous hard-liner who relishes his work and who begins and ends every conversation with an emphatic “Heil, Hitler!” The first two-thirds of the play depicts discussions between Victor and Eric; Victor and his maid, Martha (Jennifer Dundas), a pious woman who is unaware of or in denial about the clinic’s actual function and who is busy worrying about Victor’s nagging cough and warning him not to trust Eric; and Victor and Elizabetta (Tasha Lawrence), a working-class mother who insists on meeting with Victor to discuss her disabled son, who has been committed to the clinic. The final third of the play is a debate between Victor and the visiting Clemens August Graf von Galen (John Glover), based on a historical person: an ultra-conservative priest from an aristocratic family who was initially pro-Nazi enough to be appointed Bishop of Münster but soon became outspoken against Nazi policy on the disabled. Kenzler skillfully captures Victor’s mix of detachment, horror, denial, rationalization, and moments of reluctant empathy. He’s no ideologue, like Eric, whom he labels a fanatic. Victor quotes poetry and is wistful about the Weimar Republic as well as his days as a doctor who actually attempted to help his patients. But his wry alienation and reluctance to follow orders do not, of course, take away his complicity in the horrors being perpetrated. He might not have the sadistic pleasure of the over-the-top villainous Eric, but the work gets done nonetheless. The play is at its strongest when it focuses on Victor’s internal conflicts rather than external debates. Victor’s going through the files of new arrivals or obliquely airing his doubts to Martha are more effective than Eric’s speeches of robotic indoctrination or even what should be the shattering moment of Elizabetta’s grief and anger when she learns of her son’s fate. 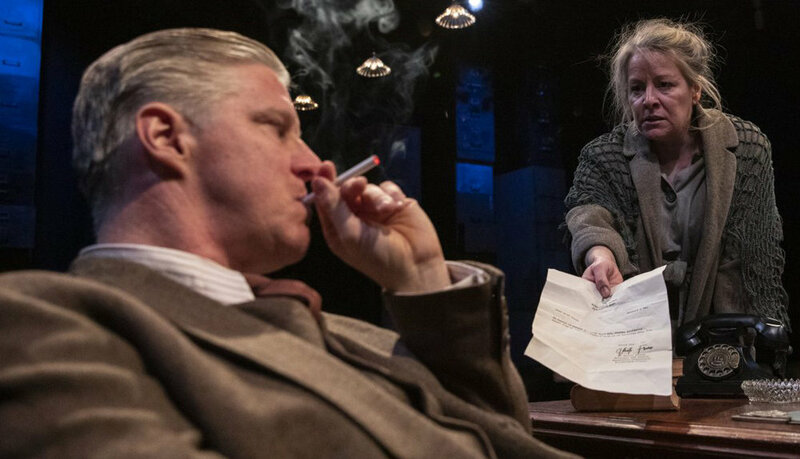 The excellent lighting design by Scott Bolman strategically emphasizes the stacks of filing cabinets arranged behind the audience (scenic design by Lee Savage), which registers the scope of the atrocity more powerfully than simply telling the audience a number. Elizabetta (Tasha Lawrence) implores Victor (Kenzler) for an explanation of her son’s death. Photographs by Maria Baranova. The debate with von Galen finds Victor offering an economic argument for the program of mass murder (which he doesn’t really believe), and the bishop offering a moral argument for the sanctity of life. Glover’s bishop comes off as rather a fanatic himself, though one on the right side of this issue. But a fundamental problem is that we aren’t watching a debate of a moral quandary—one side is for murdering children, one side is against it, and thus it is so one-sided that its emotional impact is stunted. The discussion also falls victim to man-of-God versus man-of-science clichés. The play has more than historical interest, as fascism is a word that is again relevant and with a president who mocks the disabled and has children separated from their parents and put in detention camps. All Our Children captures the evil that can be done not just by the purely evil, as in Victor’s case, and offers some riveting and chilling moments that are tempered, however, by issues laid bare instead of explored fully through character. All Our Children runs through May 12 at the Black Box Theater at the Sheen Center (18 Bleecker St.). Evening performances are at 7 p.m. Wednesday and Thursday and 8 p.m. on Friday and Saturday; matinees are at 2 p.m. Saturday and 3 p.m. Sunday. Tickets are available by calling (212) 925-2812 or visiting sheencenter.org.